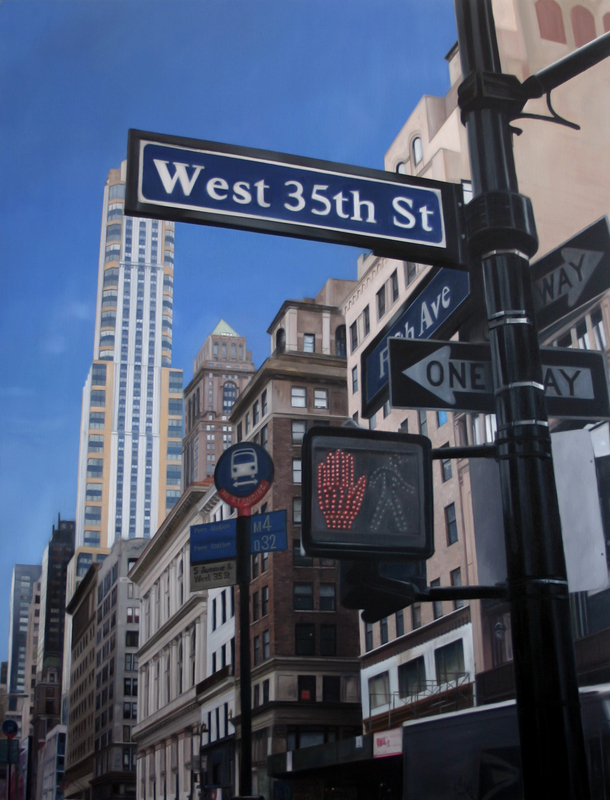 My name is Joe Simpson and I’m a British artist creating realistic oil paintings. I live in London and like to work on projects that reference cinema and pop culture. I create series of paintings that have a common theme, I like these projects to take me on a journey and draw on different inspirations. I’m primarily a portrait painter and like to paint subjects who inspire me. A few years ago I did a series painting my favourite musicians. I also did a series based on a trip I made across America, I tried to reference my favourite American artists – Edward Hopper, Gregory Crewdson and Stephen Shore. For another series, I created a number of still lifes of the toys and action figures that I grew up with as a child. This obviously changes with what I’m working on, but for my current project painting actors – I’m creating really large and complex pieces that take over 2 months each. I’m asking my favourite actors what is their dream role, and then create a painting of them in a scene that shows them as that character. They are Oil on Canvas 135 x 60cm and include detailed backgrounds. The large paintings can be quite draining – especially working on one piece for so long takes quite a bit of patience and delayed gratification. I normally start to lose confidence in it halfway through… but that normally picks up towards the end. I try to break it up into smaller sections and listen to music and podcasts to keep myself entertained and not go stir crazy. I tend not to use the term photo-realism, as you can still see the brush marks in my work and when you see them in the flesh they are clearly paintings. But I do like to achieve a sense of realism and detail that makes them feel cinematic. I compose them with light, to give the scenes I paint a kind of staged theatricality. I use really great oil paints from Michael Harding, they give rich and deep colours. I use a small amount of linseed oil to make the paint more fluid but tend to keep the paint quite thick. I use chisel synesthetic brushes, which I find useful for smooth and sharp edges. I generally work from photographs, to create the stylised cinematic feel I’m aiming for. It’s really important for me to take my own photographs, I take hundreds to work from and collage multiple images together as a reference to make one piece. I start with a pencil drawing, then block in the canvas with a basic wash to remove all the white. I then build up layers of paint increasing in complexity, working from the background forward. My paintings all depict my interests and passions in some way, so hopefully, the canvases reflect how I like to look at the world. Having my portrait of Maxi Jazz exhibited at The National Portrait gallery, which is my favourite gallery in London – was a real honour and a highlight of my career. For me it was a really good experience to have the time dedicated to practicing and developing my skills as a painter. I didn’t get a huge amount of tuition or practical skills taught, but just having 3 years to solely concentrate on art was pretty invaluable. I hope people might feel a recognition of an emotion, mood or feeling from my paintings. I like to keep things deliberately ambiguous to encourage different interpretations. Joe Simpson can be found on Facebook (@JoesSimposonArtist) and on Instagram and Twitter (@JoesSimposonArt)!